The primary story, both nationally and in local submarkets, is a dwindling months’ supply of inventory. The cure, of course, is more inventory. But new construction has been lagging during this opportune moment, and sellers of existing homes are not yet hitting the market in droves. The heart of the selling season has yet to begin, so we’re still optimistically watching for an increase in activity in the coming months. Closed Sales decreased 18.0 percent for Detached homes and 2.7 percent for Attached homes in North San Diego County. 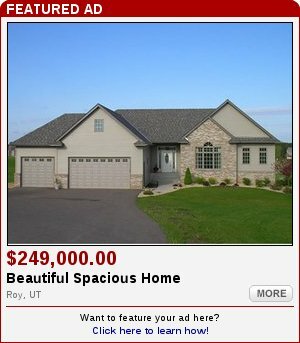 Pending Sales increased 5.0 percent for Detached homes and 26.8 percent for Attached homes. The North San Diego County Median Sales Price was up 4.3 percent to $579,000 for Detached homes and 5.7 percent to $370,000 for Attached homes. Days on Market decreased 13.0 percent for Detached homes and 29.8 percent for Attached homes. Supply decreased 22.6 percent for Detached homes and 39.1 percent for Attached homes. National housing starts were up by 10.8 percent at the end of 2015 when compared to 2014, and the unemployment rate is holding low and steady at or near 4.9 percent. Meanwhile, mortgage rates continue to astound below 4.0 percent and we have witnessed an unprecedented 70 consecutive months of private-sector job growth, although wages are flat. As consumers navigate their options, competition for the best available properties should be profound, especially if the market remains hobbled by a lack of supply. 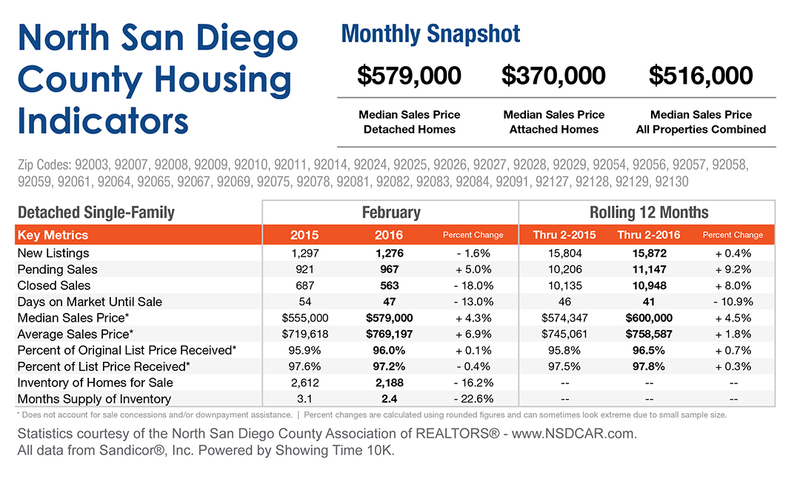 Housing statistics provided courtesy of the North San Diego County Association of REALTORS®. For additional information, call (760) 734-3971 or visit www.nsdcar.com.